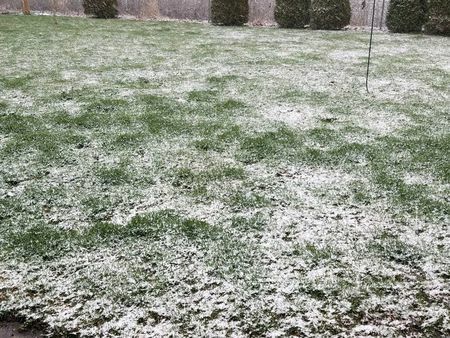 Mother Nature pulled an April Fool’s Day joke on Central Illinois Easter Sunday. Sure, the calendar says ‘Spring,’ and we’ve been hoping for the warm and blossoming season for weeks now. It wasn’t to be, not yesterday anyway. 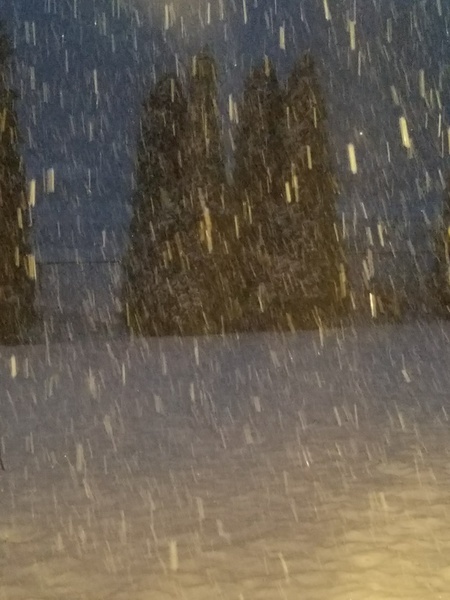 At one point, I peeked outside and it looked like the angels were having a pillow fight! 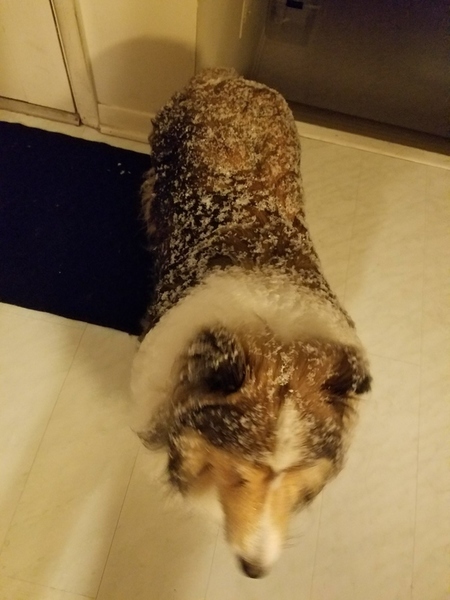 Have you ever seen a Sheltie encrusted with powered sugar? Well, Dallas was too embarrassed to look at the camera, but he said he thinks sugar would have been warmer than these snowballs! 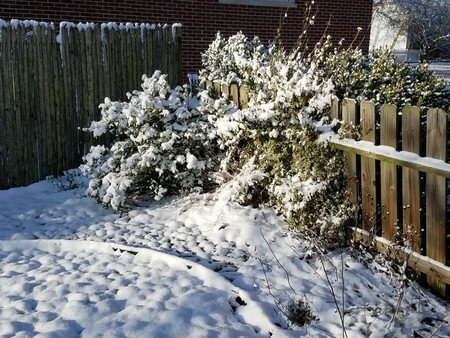 This entry was posted in Seasonal and tagged Mother Nature, snow, Spril Fool's Day. Bookmark the permalink. This year has been a strange one for sure. Thanks, Debbie. 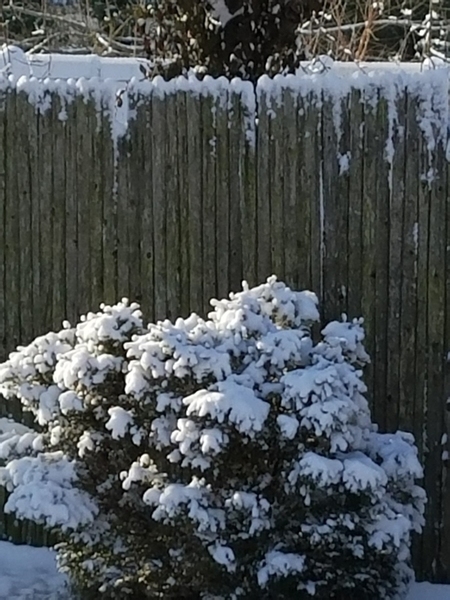 Our weathercaster pointed out that it’s most unusual to have snow on both Christmas and Easter. Guess who did?!! Us. Sigh. We had snow today too – well, more sleet really so no pretty bushes, just frozen noses! We had a bit of sleet and some hail mixed in. It was like digging to the bottom of a closet you haven’t been into for a while and finding all kinds of stuff! Bet Tommy and Tuppence didn’t like all that cold on their feeties! Debbie, we had the same kind of surprise here as well, except it wasn’t on Easter Sunday, but rather today. It SNOWED! And it’s so strange because in the week prior, it was warm and sunny. And then BAM…all of sudden the temps. dropped into the low 40’s and turned into Winter. Hasn’t this been the strangest Spring?!?! 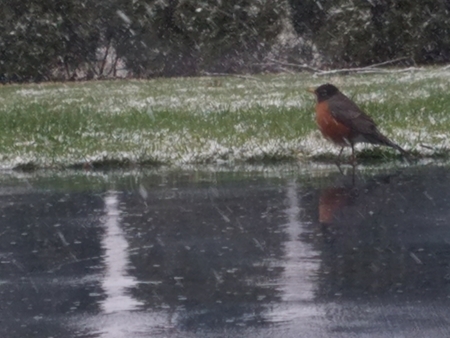 Your photographs are awesome; especially the one of the robin! LOVE the photo of Dallas in his powdered sugar coat. What a cutie he is! You’re so right about that. It reminds of white icing on a cake! Thanks so much for sharing the last of our beautiful Spring/Winter season. Poor Dallas. He really loves the snow when it’s powdery, but that wet stuff really sticks to his fur. He’s also not too happy about standing on the rug at the door and waiting while I towel him off. I keep hoping this will be winter’s last gasp, and I keep getting disappointed. The named winter storms just keep coming — we’re up to “W” now, with no end in sight. I think I heard the weather folks say Washington D.C. could get 8-12 inches of snow this week — yikes!! Happy Wednesday! Don’t work too hard, and get your errands completed before more winter arrives!! 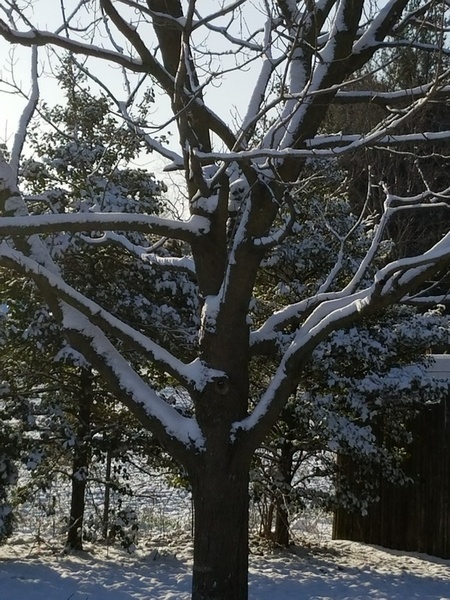 Fresh snowfall is so beautiful – especially when you know it will melt before it has a chance o turn to dirty, ugly snow! So exciting!!!! And National Champs in Fencing, too!! I always loved those late, warm snows, and your photos remind me why they seemed so delightful. Top of the list, of course, is that they aren’t going to last for months. I love the photo of Dallas. For some reason, his snow-balled fur reminds me of the wool mittens we wore when we were kids. The fibers and snow always balled up on them, too. Then, we’d put them on the radiators to dry, and the smell of wet wool permeated the school! Linda, I was amazed when all that snow just vanished the next day! I figured we’d be in for a week at least, considering how much fell and how cold it’s been. They’re talking about snow showers both for Friday and for Sunday — as if we need more snow. However, I understand this is exactly the kind of snow the farmers like, as it provides a nice, even soaking for the ground. I’m glad you reminded me about the melting mittens. I don’t think mine were ever wool, and I know we didn’t dry them on a radiator, but I do remember the wet mess they made. My mom with great reluctance suited us kids up and sent us out to play, knowing we’d get cold and wet after only a few minutes and insist on coming back inside — kind of like Dallas, ha! Debbie, I can’t get over all this sleet/snowy weather you’re getting. Poor Dallas! Love the photos though. It’s been cold here too—staying in the 60s most days and getting way down into the 50s at night! Can you believe it!! Are back, my friend??? I’ve missed you and will hop on over to your place to see what you’ve been up to. I hope it’s been something wonderful, rather than problematic. Glad to see your happy face again! Debbie, I got some new (increased) responsibilities at work that have left me with little time for much else. And somehow it’s sapped my creativity and blogging ideas from my brain. It’s left me too wiped out for much else. Wish I could go back to blogging every week but alas…Sad.